What Do You Remember About the Restaurant? I don’t go out to eat all that often, but I had the pleasure of joining a few friends at Modesto on Saturday for tapas. It was a lovely evening filled with nearly a dozen shared dishes, some delicious drinks, and interesting conversation. One of the topics we discussed was memory; specifically, what we remember about eating at restaurants. Do you remember what you ate? Do you remember whom you were with? Do you remember where you sat? Do you remember when exactly you were there? The fascinating thing to me was that we each had very different answers for those questions. For example, I ate at Modesto about 18 months ago. I have no recollection of what I ate (other than a theory that I may have eaten the bacon-wrapped dates), nor do I remember my company. 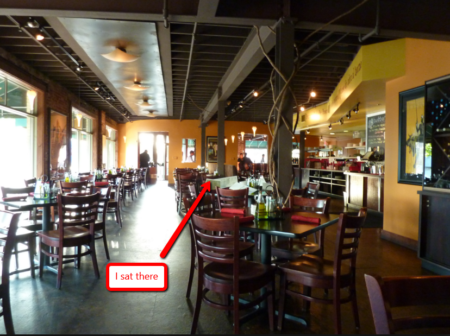 But I know exactly where I sat–the exact table and chair. I understand that spatial relations are important–our brains are built for it–but it seems like the least important thing I could remember about the restaurant. I would much prefer to remember what I ate and if I liked specific dishes, and after that I’d want to remember who ate with me. Dead last on the list is the chair I used. As I said, everyone at Saturday’s table had a different answer. I’m curious what you remember about the restaurant you selected for this experiment–feel free to check multiple boxes on the poll below or comment. This entry was posted on Sunday, May 1st, 2016 at 11:13 pm	and is filed under restaurants and tagged with restaurants. You can follow any responses to this entry through the RSS 2.0 feed. It sometimes depends on the restaurant, I went to a small Ramen restaurant in Austin, There was not much interaction with the servers, but I remember everything else about the experience, While on the same trip I went to the Alamo Drafthouse and I remember the movie, the server, and where I sat, but can’t even remember what I had to eat. The later part with the server was mainly as they were very personable and we even talked about the philosophy of the movie afterward. I wonder how much this is influenced by a person in this scenario having the ability to choose the memory. My answer might be totally different if you said to me, “Trevor, remember that we ate at X restaurant 6 months ago? What do you recall about that experience?” Sometimes I may only vaguely recall actually going to the restaurant at all in that scenario. However, if you ask me to select an experience from 6-12 months ago, I think I can recall most of the details mentioned in this entry. I’m impressed that you two are able to remember so many details! Though, Trev, that’s a good point that since I’m asking you to think of the restaurant, you’re picking something that was memorable to you. I post Where I sat. Because it is the decor I often remember.